for $239,000 with 3 bedrooms and 2 full baths. This 1,676 square foot home was built in 1989 on a lot size of 0.46 Acre(s). POCONO CONTEMPORARY 3 Bedroom PLUS LOFT, 2 Full Bath W/EXCELLENT RENTAL HISTORY. Open Concept makes for great entertaining space! Clean, spacious and plenty of natural light. Newer roof, updated Kitchen ALL NEW STAINLESS APPLIANCES, granite counters and tile backsplash. Both Baths have granite vanity tops. Living room has soaring ceiling w/stone fireplace highlighted by the floor to ceiling tongue & groove accent wall. Large screened porch right off the dining area that leads to deck. Plenty of parking and a level lot partially cleared for outdoor fun. 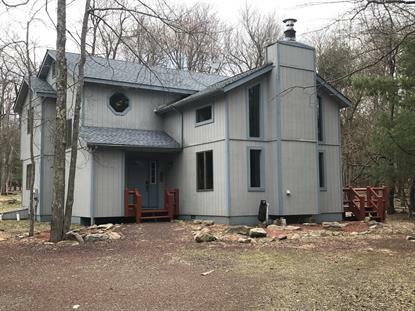 ENJOY THIS HOME ALL SEASONS w/the ski areas, restaurants, nightlife, golf, Split Rock Resort offers indoor waterpark, movie theatre etc & hosts many festivals throughout the year. Access to PRIVATE MOTORBOAT LAKE & beach all within 5 min.